Arenthia is a city in northern Reaper's March. The city has been seized by Colovian invaders, led by General Lavinia. The majority of the city is only accessible during the two major quests here. You cannot enter the Residential District, Temple District, or Tower District before or after these quests. 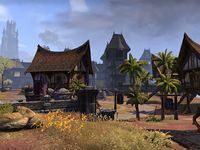 The city consists of two well differentiated areas: the Imperial-style citadel, to the south, and the Khajiit-style shantytown, to the north and by the river. At the same time, the citadel has three districts: the Residential District, the Temple District, and the Tower District. 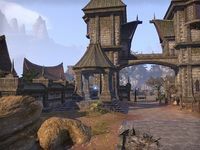 Due to the position of Arenthia, the Second Empire constructed Arenthia over an older Bosmer settlement to serve as a center of trade between Colovia, Anequina and Valenwood. Arenthia docks are also very busy and ships loaded with wood sail down the Strid River. Skooma smugglers are present in the city and they operate out of the city's disused Temple to the Divines. Arenthia was deemed to be militarily strategic too, for which reason the citadel was heavily fortified with tall walls and defensive towers, and two big stone bridges were constructed across the Strid to ease troop movements between Cyrodiil, Valenwood and Elsweyr. Although nominally part of Valenwood, there is a heavy Khajiit presence. So much so that even the leader of the resistance against Colovian occupation, Kazirra, is one. After the eventual defeat of General Lavinia and the Colovians, Kazirra seized power as Clanmother on behalf of the Aldmeri Dominion, completely ignoring the question of whether it should be part of Valenwood or Elsweyr. After this most of the Imperials fled the city and the citadel became inaccessible, but life in the rest of the town normalized and Resistance soldiers patrolled the streets. The dro-m'Athra are also conspiring to take the city, but its menace is for now contained to one dissident. For more information on Arenthia, see the lore article. Arenthia Objective: Aid Cariel and the Arenthian Resistance.